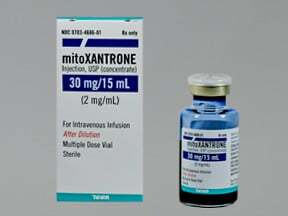 Mitoxantrone must be given only by injection into a vein. Do not give by injection into a muscle, under the skin, or into the spinal cord. If this medication accidentally leaks into the skin/muscle around the injection site, it may cause severe damage. Tell your doctor right away if you notice redness, pain, or swelling at or near the injection site. This medication may rarely cause serious (rarely fatal) heart problems (including heart failure). This effect may occur during treatment or months to years after treatment is completed. The risk of heart problems is affected by your dose, medical history (including previous heart disease, radiation treatment to the chest area, or if you have MS-multiple sclerosis), and previous use of this and other drugs (including doxorubicin or daunorubicin). Tell your doctor right away if you notice symptoms such as irregular heartbeat, shortness of breath, sudden weight gain, or swelling ankles/feet. Very rarely, people who are treated with this type of medication have developed new cancers (e.g., secondary leukemia). The risk may be increased when this medication is given with certain anti-cancer drugs or radiation treatment. Consult your doctor for more details. Laboratory and/or medical tests (e.g., complete blood count, heart/liver function tests, ECG) should be performed before starting treatment and periodically to monitor your progress or check for side effects. Consult your doctor for more details. 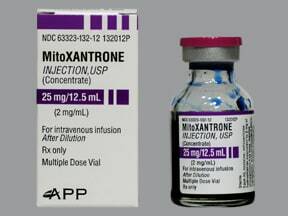 Who should not take Mitoxantrone HCL Vial? 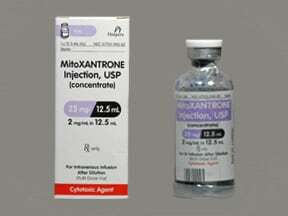 Mitoxantrone is used to treat leukemia and other cancers. It is also used to treat multiple sclerosis. It belongs to a class of drugs known as anthracenediones and works by slowing or stopping the growth of certain cells (including cancer cells and cells that affect the body's natural defenses). Read the Medication Guide provided by your pharmacist before you start receiving mitoxantrone and each time you get a refill. If you have any questions, ask your doctor or pharmacist. This medication is given by injection into a vein by a health care professional as directed by your doctor. Dosage is based on your medical condition, body size, and response to treatment. If this medication touches your skin, immediately wash the area well with soap and water. If this medication gets in your eye, open the eyelid and flush with water for 15 minutes, then seek immediate medical attention. 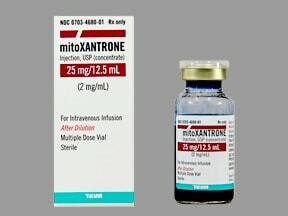 What conditions does Mitoxantrone HCL Vial treat? Nausea, vomiting, diarrhea, headache, or unusual tiredness may occur. In some cases, your doctor may prescribe medication to prevent or relieve nausea and vomiting. Eating several small meals, not eating before treatment, or limiting activity may help lessen some of these effects. If these effects persist or worsen, tell your doctor or pharmacist promptly. Severe nausea, vomiting, or diarrhea may rarely cause a loss of too much body water (dehydration). Contact your doctor promptly if you notice any symptoms of dehydration such as unusual decreased urination, unusual dry mouth/increased thirst, lack of tears, dizziness/lightheadedness, or pale/wrinkled skin. Temporary hair thinning/loss may occur. Normal hair growth should return after treatment has ended. This medication may cause your urine to turn blue-green. The white part of your eyes may also turn a bluish color. These effects are temporary, normal, and harmless. Tell your doctor right away if you have any serious side effects, including: menstrual changes (e.g., stopped periods), unusual bleeding/bruising (e.g., small red spots on the skin, black/bloody stools, bloody urine, vomit that looks like coffee grounds), numbness/tingling feelings, seizure. 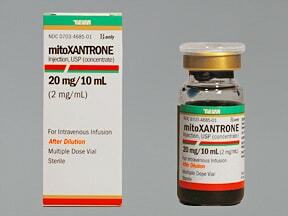 List Mitoxantrone HCL Vial side effects by likelihood and severity. 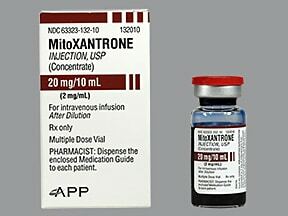 Before using mitoxantrone, tell your doctor or pharmacist if you are allergic to it; or if you have any other allergies. This product may contain inactive ingredients, which can cause allergic reactions or other problems. Talk to your pharmacist for more details. Before using this medication, tell your doctor or pharmacist your medical history, especially of: blood/bleeding disorders (e.g., anemia, low blood cell counts), heart disease (e.g., congestive heart failure, irregular heartbeat), liver disease, radiation treatment, recent/current infection. This medication is not recommended for use during pregnancy. It may harm an unborn baby. Before you start treatment and during treatment with this medication, your doctor may direct you to have a pregnancy test. If you become pregnant or think you may be pregnant, tell your doctor right away. To avoid pregnancy, both males and females using this drug should use reliable form(s) of birth control (e.g., birth control pills, condoms) during treatment. Consult your doctor for details and to discuss effective forms of birth control. What should I know regarding pregnancy, nursing and administering Mitoxantrone HCL Vial to children or the elderly? Does Mitoxantrone HCL Vial interact with other medications? 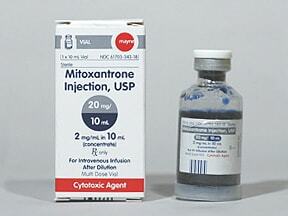 Are you taking Mitoxantrone HCL Vial? 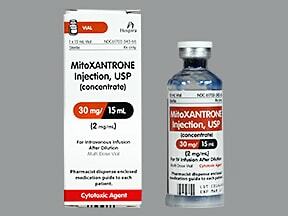 Are you considering switching to Mitoxantrone HCL Vial? How long have you been taking Mitoxantrone HCL Vial?